The Phoenix healthcare real estate market is currently evolving as healthcare reform is implemented. Specifically, within the last few years, two healthcare REITs have acquired most of the medical office buildings (MOBs) in Phoenix comprising 20,000 square feet or more. In the past, these buildings were typically owned by private healthcare real estate investors; however, competition for healthcare developments has increased for both developers and investors, as growth in this asset class follows the hospitals and patients. The landscape of the hospital organizations in the market is changing to adapt to the Affordable Care Act (ACA). The two healthcare REITs with the largest footprint of medical office assets in the Phoenix market are Healthcare Trust of America (HTA) and Healthcare Property Investors (HCP). HTA focused on acquiring assets surrounding the Banner Health hospital campuses. As Banner Health purchased the SunHealth hospital systems, HTA acquired the MOBs surrounding these hospitals in the Sun City submarket. HCP further increased its market share of Phoenix MOB assets in 2012 by purchasing the Scottsdale Healthcare portfolio, consisting of MOBs on three hospital campuses in the Scottsdale submarket. 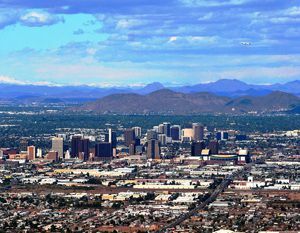 REITs remain interested in the Phoenix healthcare real estate market due to access to cheap capital and ongoing positive investment fundamentals of the medical office building asset. In a September 2011 article entitled, “Commercial Real Estate Investment: REITs and Private Equity Real Estate Funds,” Morningstar found that REITs provide better returns than private real estate funds due to liquidity, transparency and access to financing. The smaller, private healthcare real estate investor will have to compete with REITs on larger asset acquisitions and have capital to continue to market, lease and maintain the property after purchase. The private healthcare investor can continue to compete in the medical office development and build-to-suit arena, as REITs typically focus on cash-flowing assets. The hospital landscape continues to adapt to the healthcare reform with new developments that are closer to the patient population for outpatient services. In turn, new hospital-sponsored developments create opportunities for complementary healthcare real estate development opportunities in residential areas for real estate developers and investors. A May/June 2014 CCIM article, Medical Office Fever: Healthcare Development Competition Heats Up, makes the case that MOBs will continue to offer positive investment fundamentals and will therefore continue to be in demand. The article also predicts that the future trends in healthcare real estate development include sites to be based purely on patient demand; an increase in the footprint of MOBs, from the 120,000 to the 150,000-square-foot range; and investment funding to include more sources. Lastly, Arizona has recently seen several ongoing changes to its hospital systems. Hospital acquisitions include the purchase of the Abrazo/Vanguard Healthcare system by Tenet Healthcare Corporation and Banner Health’s purchase of the SunHealth system. Consolidations and collaborations among hospital systems include the Scottsdale Healthcare and John C. Lincoln affiliation in Phoenix, and the tri-party agreement between Dignity Healthcare, Tenet Healthcare Corporation and Ascension Health in Tucson. We anticipate advising our clients on the opportunities that these changes present to the market.